Whilst watching this match, we stood next to the umpire, Lars Graaf who was chatting with the ATP doubles player, Treat Huey. They were discussing Andy Murray‘s chances with Graaf not holding any hope at Wimbledon for Murray. 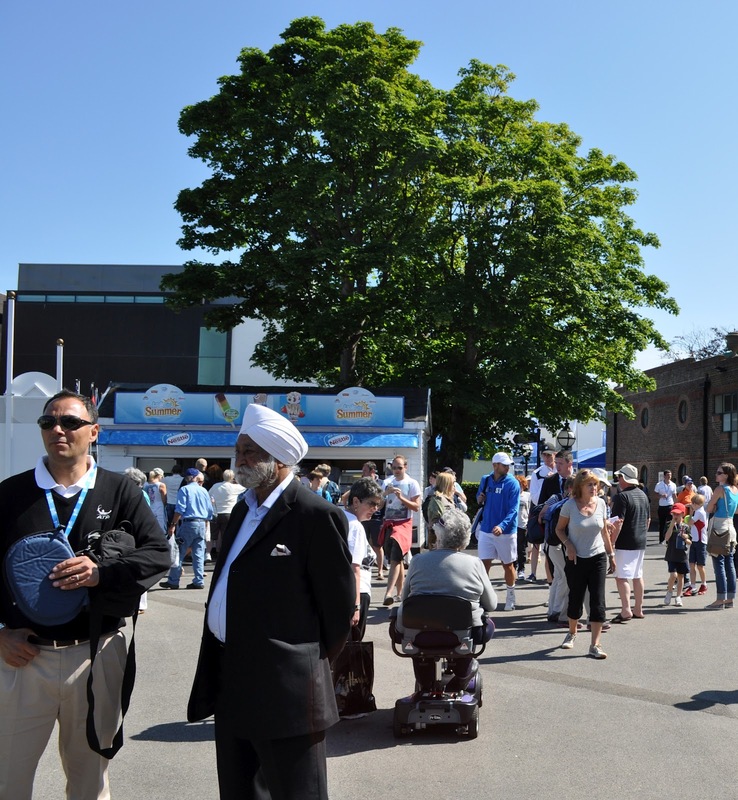 This is one of the things I love about going to tennis events as you can pick up interesting tidbits around the grounds! 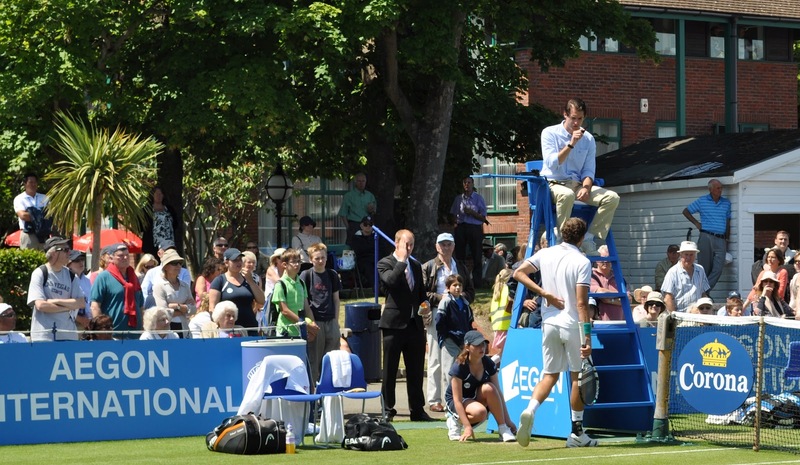 Julien Benneteau requests the trainer… another umpire, James Keothavong was watching the match in the far left corner of the picture! 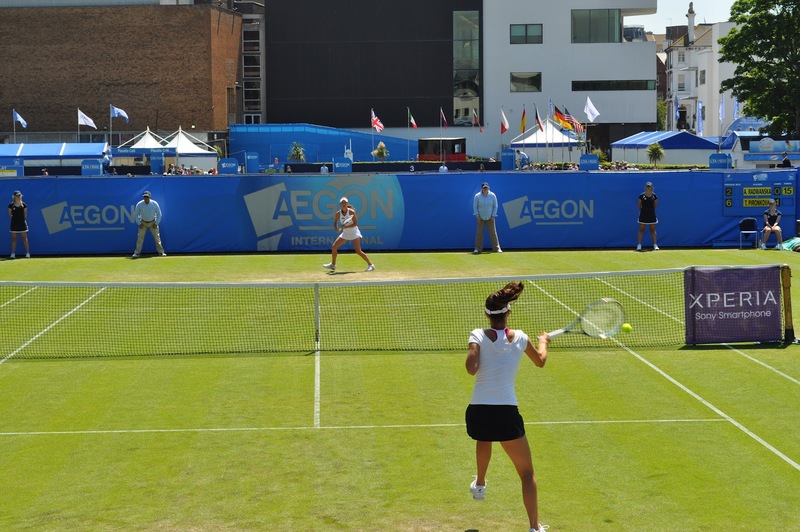 When we saw Radwanska was a set down we headed round to court one and watched a few games from the back of the court. This year, they have charged people to go on two of the three main stands, which was most likely reason for the lacklustre attendance. From all the players I saw on Tuesday, Radwanska generates the least pace although I admire her craft on the court. However on this occasion she was outdone by Pironkova‘s forehand slice and continues to dollop the second serve. 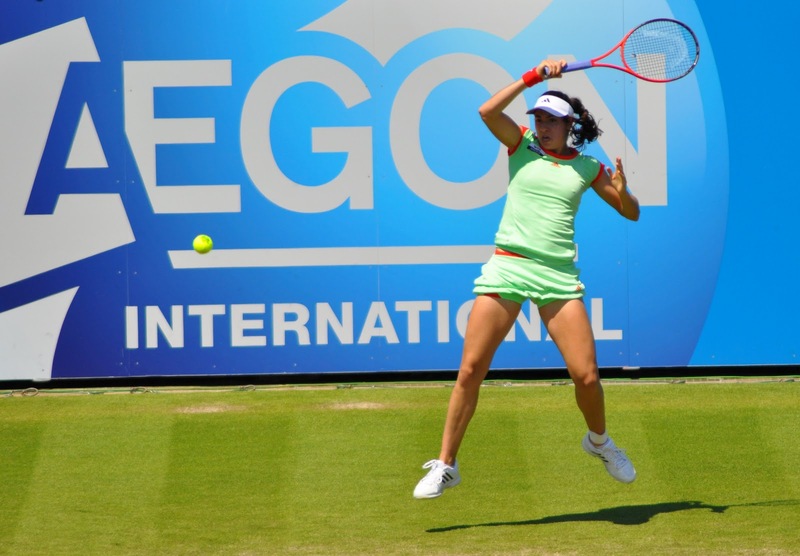 Pironkova is another player that will be dangerous on the grass as she will be unseeded. Pavlyuchenkova was playing pretty well in this match although she was helped out by an injured opponent in Hsieh. She looked marginally fitter and was coming into the net too, which was positive. We stood next to her coach who kept telling her to focus on the next point when she struggled to close the first set out and was really trying to keep her thinking positive. We missed most of the first set watching matches on the outside courts, but joined to find Wozniacki all over the place. She was hitting the ball well in practice, but that had not translated well to the match and she appears to be struggling to find the right balance between defence and attack. The second set failed to ignite early on with short rallies and errors aplenty. However things slowly picked up towards the end of the set as Wozniacki levelled at one set all. 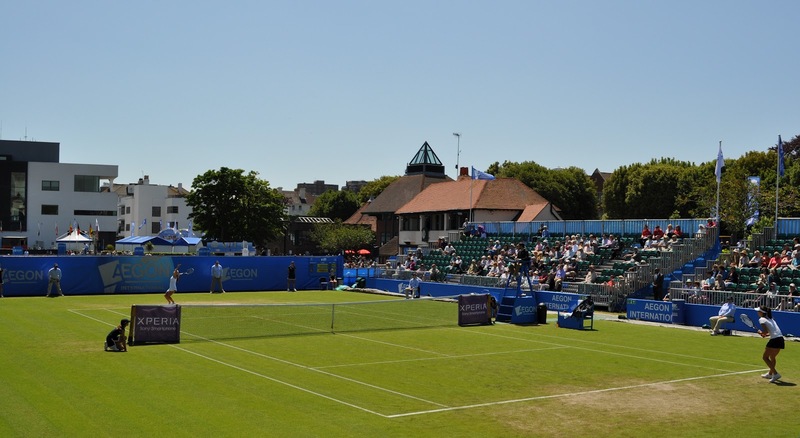 McHale will have no doubt made some new fans with her performance in Eastbourne. She played a really gutsy tiebreak saving multiple set points on a number of terrific baseline rallies. She was undone by an unfortunate slip at 6-6, but she really raised her game throughout the third set as she took the match to Wozniacki playing much more aggressively. 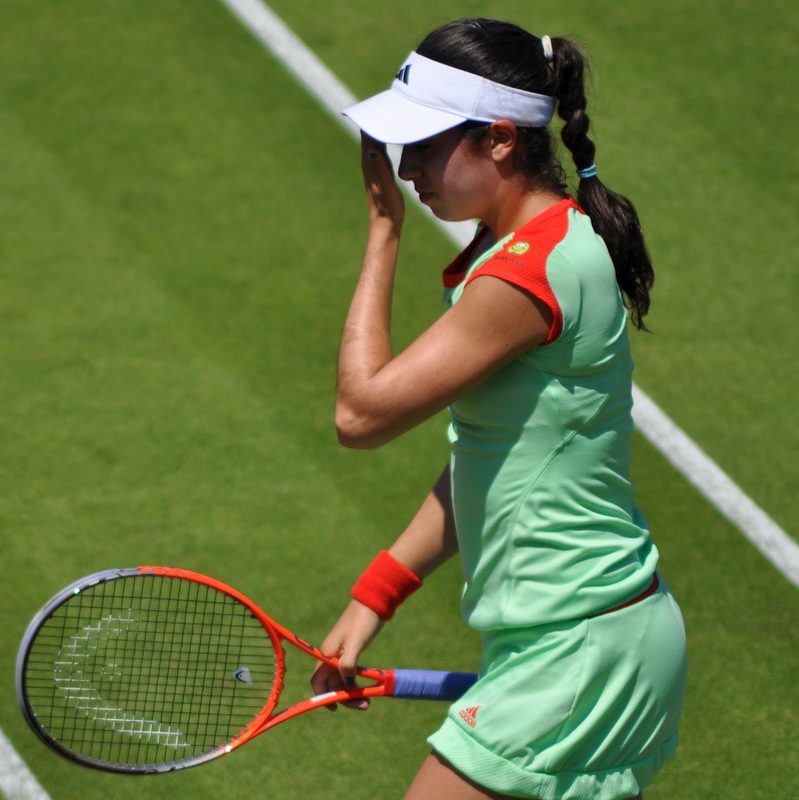 McHale has suffered a number of choking episodes in her career, but she finished the match well and deserved the win. Wozniacki is starting to lose more of these tight matches and I get the feeling her confidence is quite low at the moment. I only saw a few points from this match but it easily looked like the best women’s match of the day. In the final set tiebreak both players were destroying the ball with pinpoint accuracy. It was a shame that this match was out on court number five, which is essentially on the practice courts so there were less viewing opportunities. Babos was literally screaming and screeching during and after every point she won. Safarova was the more emotionally stable and came back from a mini-break down in the tiebreak to win the match, 3-6 6-3 7-6. Greta Arn seemed to be warming up all day just outside the centre court, but it didn’t seem to help as she was not playing particularly well in this one. 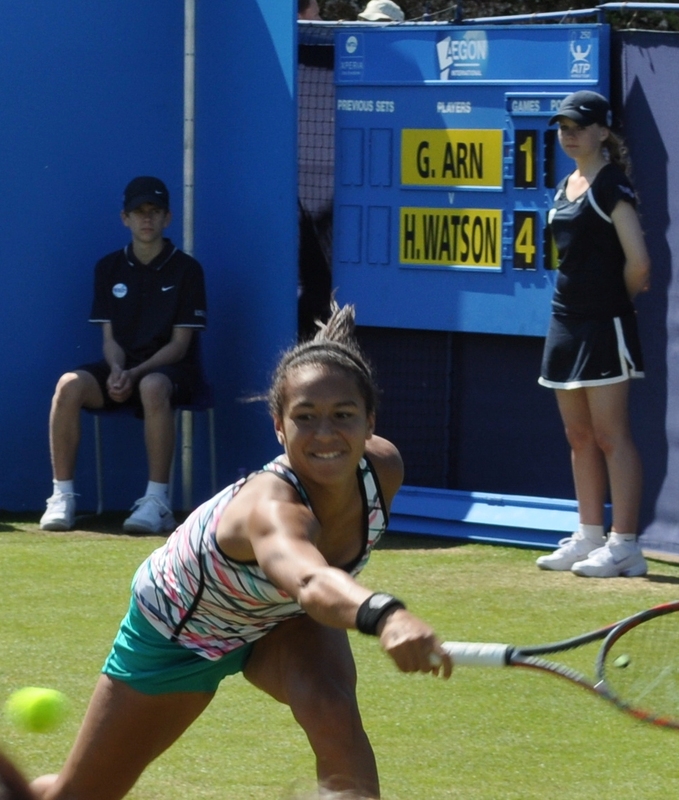 Watson was solid yet unspectacular and did not get broken during the whole match. 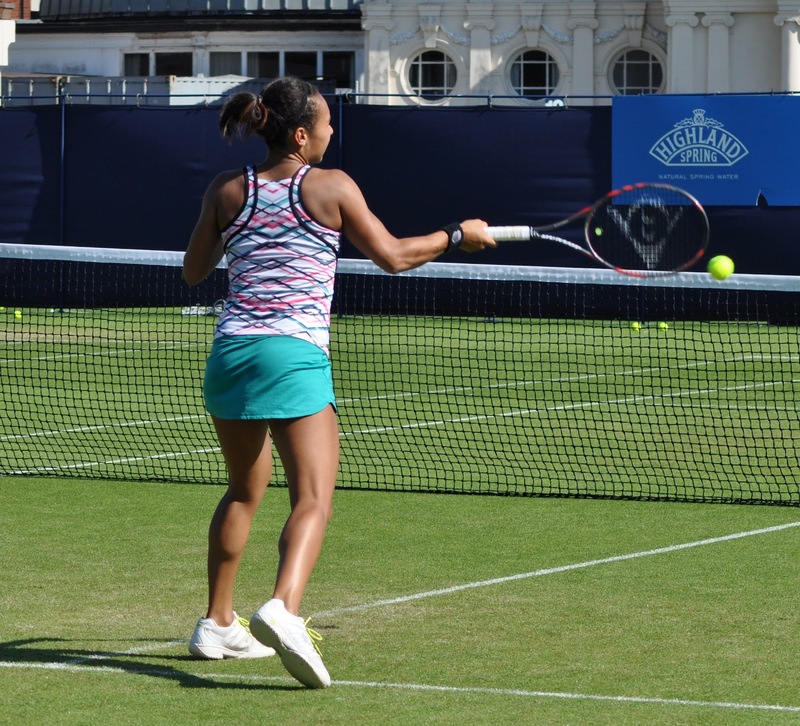 After the match, I walked past Watson and overheard her telling the security guard that she “just couldn’t get loose” during the match… five minutes later we saw her back out on the practice courts! 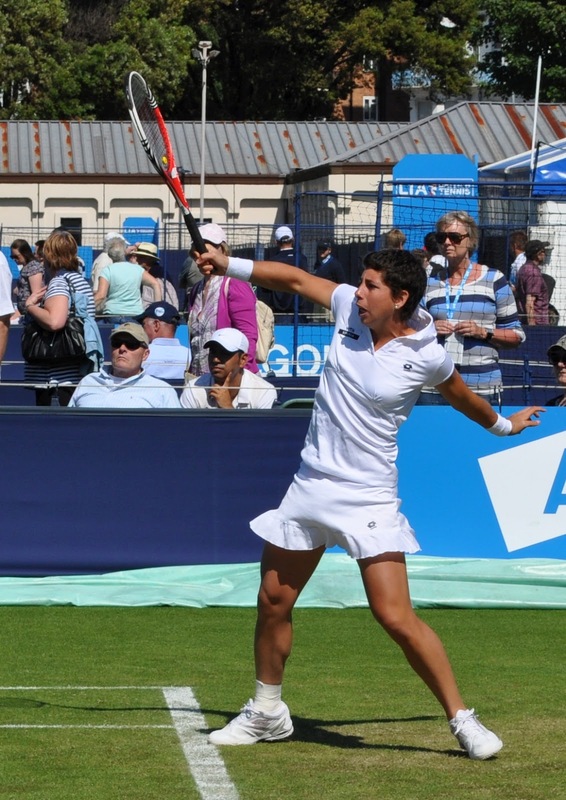 I only saw the first game, but Suarez Navarro‘s backhand is a touch of beauty! In the first two points it was on full display along with her flowing all court game too; however she ended up losing 6-4 6-4 and although her game is pretty to watch, she was not as solid as Dubois. The biggest disappointment of the day was what was billed as the highlight of the day. Querrey was completely off-range in the beginning continually going long with all his shots and looking a bit disinterested. 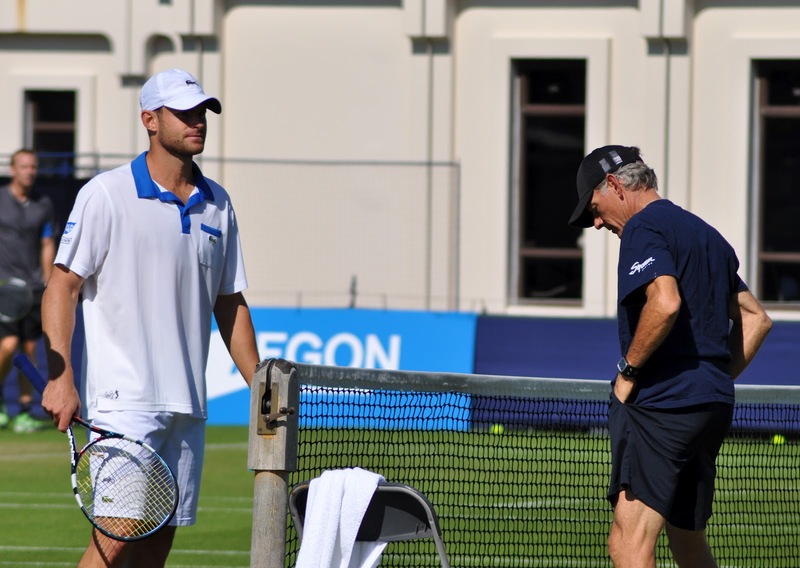 It was not a big surprise when he retired at 5-2 down in the first set with a back injury, but it was a shame for the crowd who wanted to see more of this match and in particular, Roddick. Querrey and Roddick on centre court… I was so happy with our seats!!! 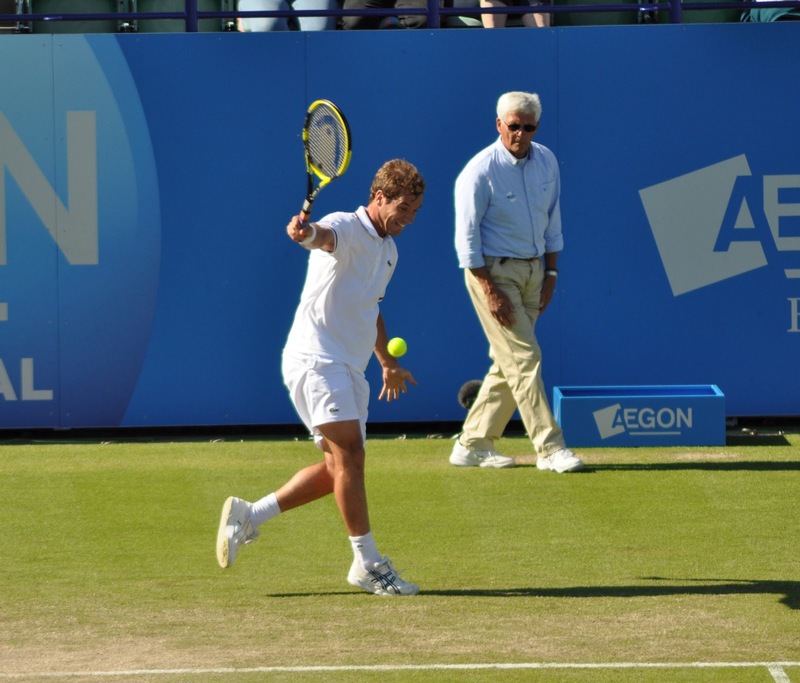 I was really pleased to get a chance to see Gasquet for the first time. 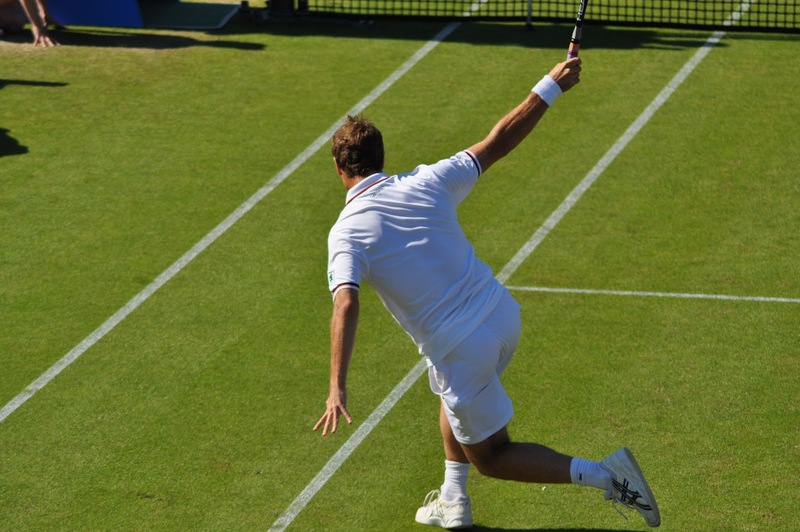 In 2007, I nearly got the chance to see Gasquet play Andy Roddick in the 4th round of Wimbledon, but rain cancelled the match on our day… it turned out to be an epic encounter! 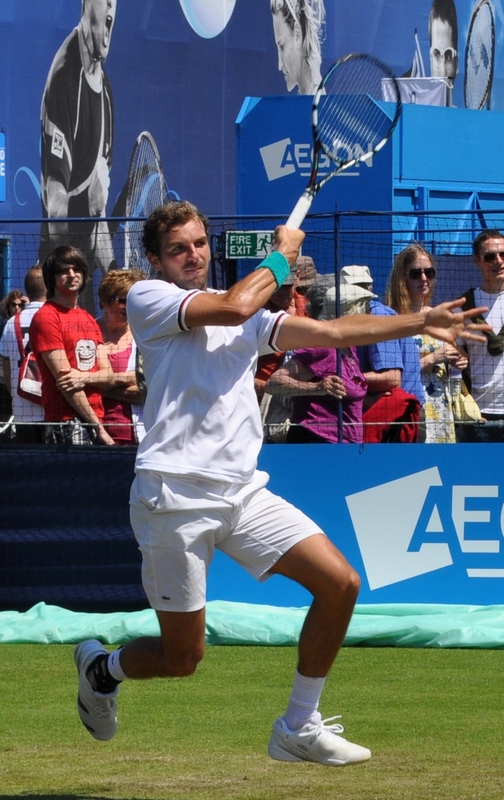 Gaquet’s backhand is magic although he was overshadowed in this match by Matosevic who was constantly moaning and was always on the wrong end of line calls from the umpire, Mohammed Layani. I must point out that Layani is my favourite umpire… this guy is a total ledge! His over pronounciation of the scores, immediate overrules and general mannerisms just made this so much more entertaining. We had to leave halfway during the second set at 6-1 2-2 to catch our train home, but I was shocked to hear Gasquet ended up losing the match, 1-7 7-6 7-6! 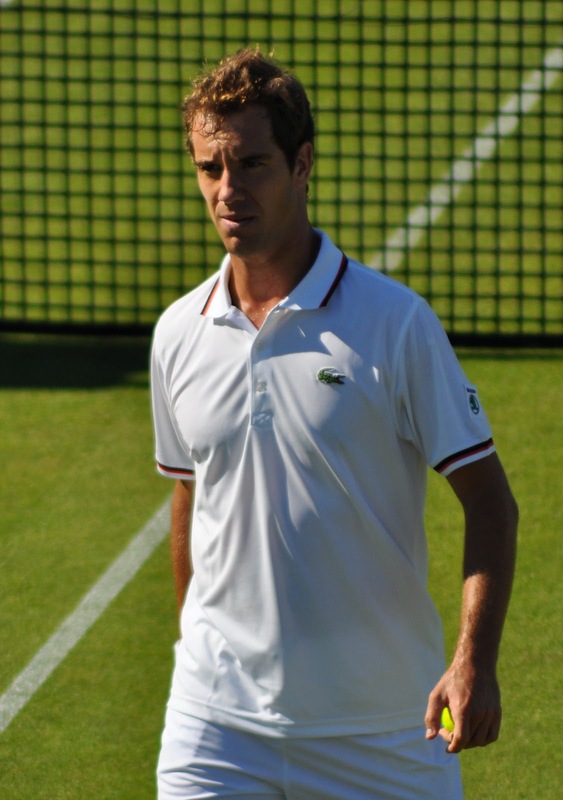 A bad loss for Gasquet but I doubt it will affect him too much going into Wimbledon. As I took a picture of Roddick and Querrey approaching me, it was only when I looked at my photos on the computer that Mohammed Layani was standing right in front of me! 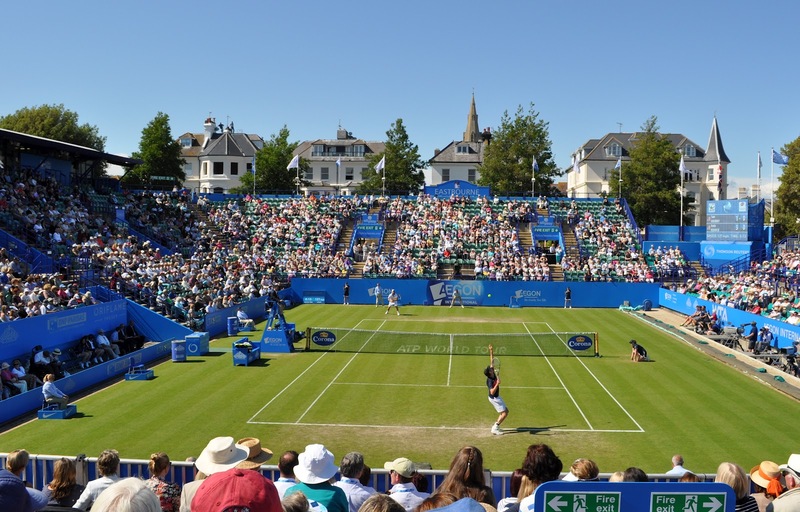 June 21, 2012 in Eastbourne.